The Standard and Poor’s 500 Index, a key measure of the U.S. equity market, closed above 2,000 the first time on August 26, 2014.The Index includes 500 leading U.S. companies and captures about 70% of available U.S. market capitalization. The S&P 500 Index first appeared in March 1957. 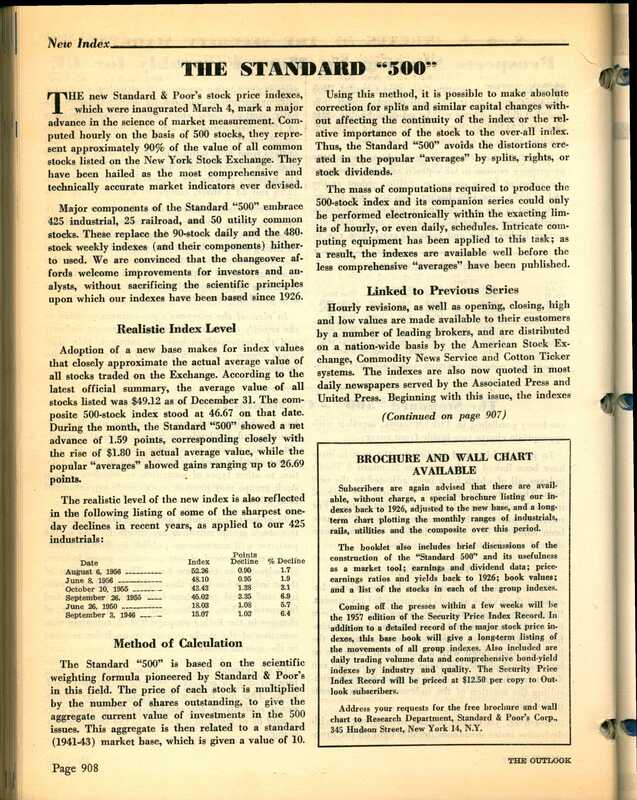 Described as “The Standard 500” in the OUTLOOK (March 11, 1957, p.908) S&P mentioned the “intricate computing equipment applied to the task” of calculating the Index every hour. Today, the Index is calculated every 15 seconds. Oddly enough, S&P didn’t list the stocks that composed the Index in the OUTLOOK. You can find the initial list of 500 companies scattered among the 91 industry subgroups that made up the Index in Standard & Poor’s Security Price Index Record for 1957. For the subgroup “Confectionery”, for example, the 500 component companies were American Chicle, Hershey Chocolate, Sweets, and Wrigley (p. 29). The Index has undergone many changes since its inception, both in the companies that compose it, and in the way that it is calculated. Currently, only 86 of the original 500 companies are still part of the Index. S&P will delete companies from the Index if they have been merged or acquired, have gone private, or no longer meet standards for market capitalization, number of stockholders, or U.S. ownership. U.S. companies that meet S&P’s criteria are then substituted. Standards for Index membership include stock value of $4 billion or more, a public float of 50%, and at least four consecutive quarters of positive earnings. 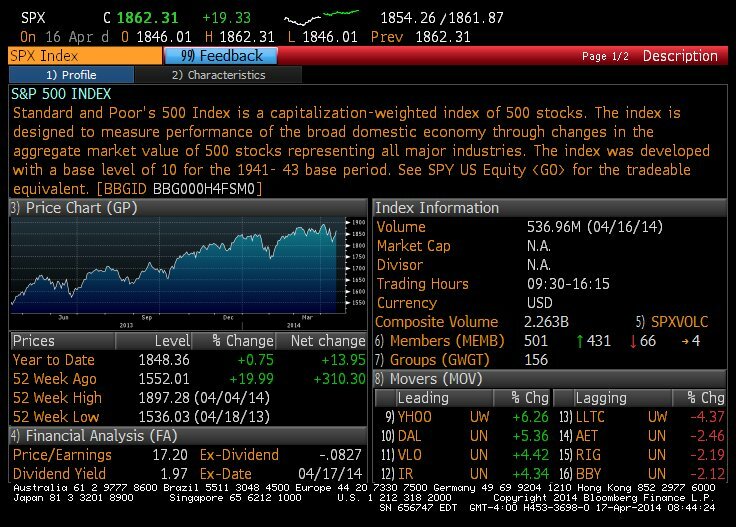 Below is a description of the S&P 500 Index from Bloomberg (ticker SPX). 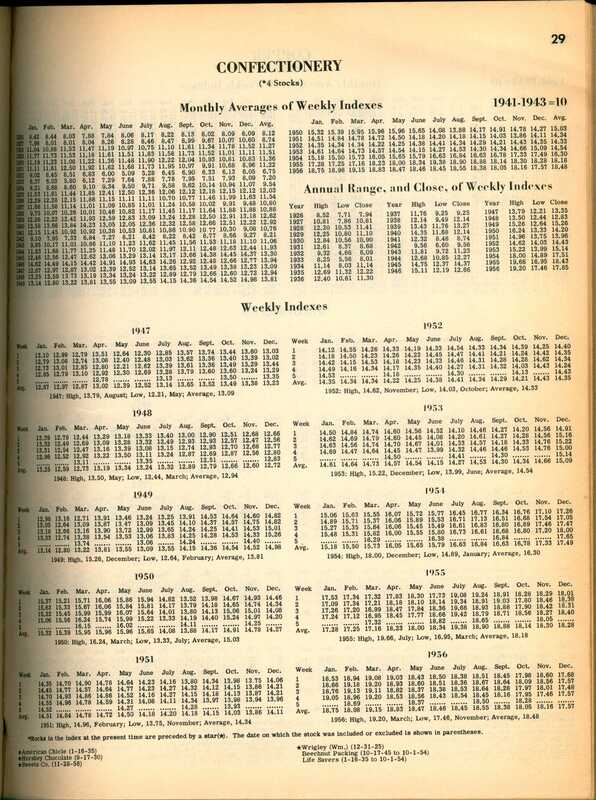 Because of its central importance as a measure of the U.S. stock market, researchers are often interested not only in the current constituents and price of the index, but in its historical price and composition as well. What stocks compose the Index, now and historically? What is the current and historic value of the Index? The WRDS (Wharton Research Data Service) versions of COMPUSTAT can answer both of these questions. Select output type and submit. 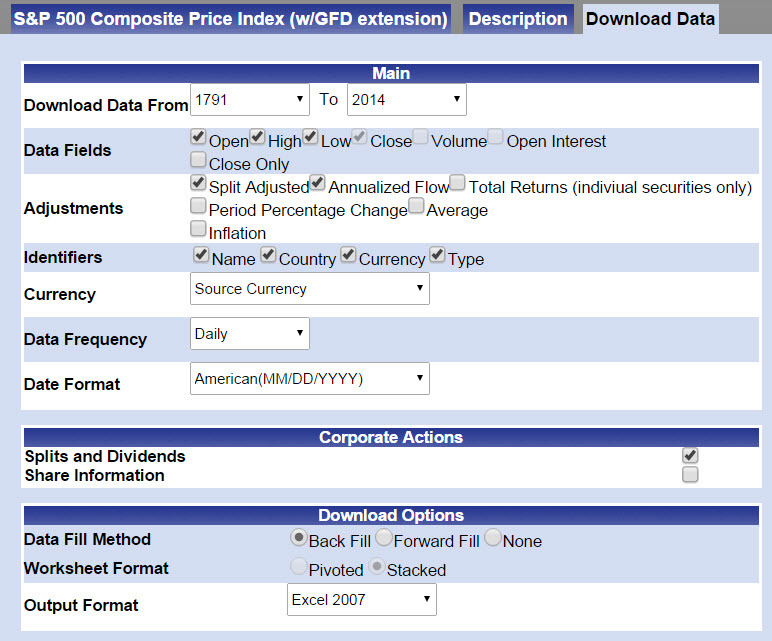 To find the code for the S&P 500, click on Code Lookup in Step 2 and search for S&P. There are many industry subgroups of the S&P as well as additional S&P indices. “Aerospace/defense Small Cap” is one example. Display/download the information as a graph or as a time series. Here is the complete historical run displayed as a semi-log graph. If you were hoping to chart the daily S&P Index surrounding specific events, such as the 1929 Crash, you will be disappointed. 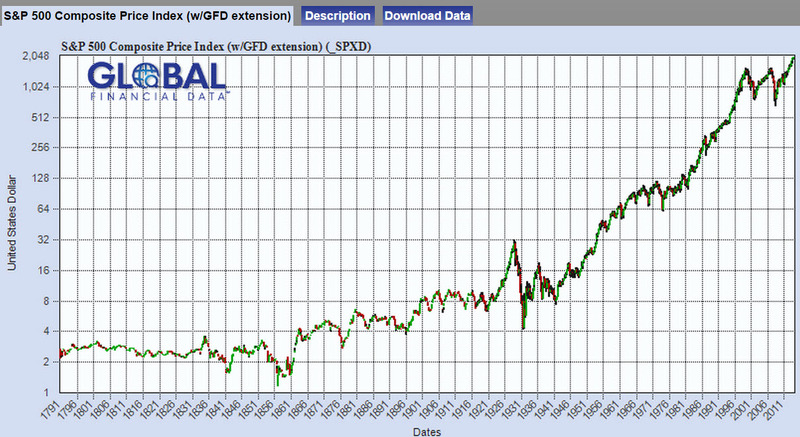 GFD’s version of the S&P Index is only calculated by month to December 1987. Its daily version runs from January 1988 to date. This entry was posted in Research Topics and tagged constituents, finance, indices, S&P 500, Standard & Poor's, stock market, Wharton by Michael Halperin. Bookmark the permalink.